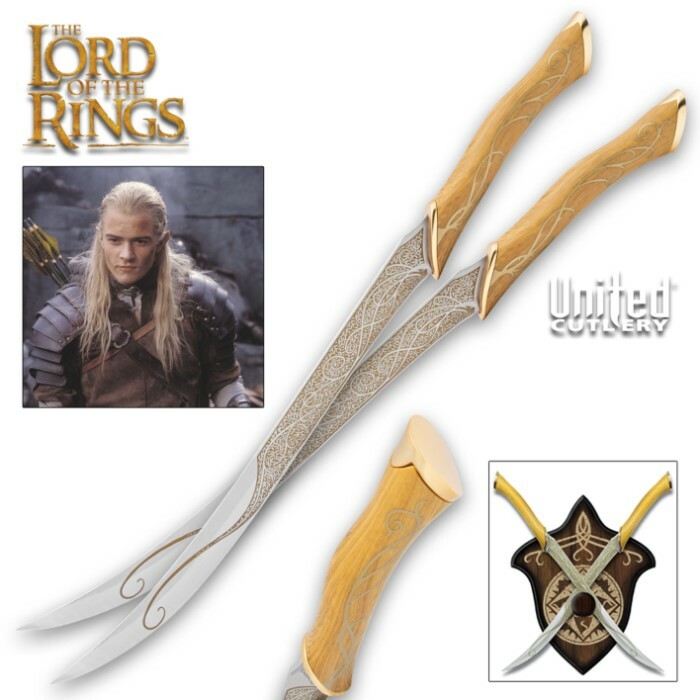 Licensed reproductions of the fighting knives wielded by Legolas. Each fully sharpened 15 3/4" stainless steel blade features gold tone color and full tang construction. The solid American oak handles offer Elven vine design, cast metal guard and pommel. Includes a 12 5/8" x 15 11/16" x 3/4" wood plaque adorned with the badge of the Greenleaf family of Legolas. Includes certificate of authenticity. My husband bought me these for Christmas and I was over the moon! They are absolutely beautiful. Weighted enough to spin and wield and beautiful enough to adorn my LOTR, TH wall!! I am in love with them! I gave these to my friend for Christmas and he absolutely was blown away by them! They were actually pretty sharp and feel great in your hands! I received my fighting knives today and I must say that I am very pleased with them i have 9 other hobbit and lotr swords and I love them all! I think they look better in person. The wood handles are a little darker compared to the picture but I prefer it darker. They're not sharp at all just pointy but that's okay, I didn't intend to use them anyways, its just for display. I absolutely love these knives! They look beautiful on my wall and they're price is great. I see people complaining about the color differences in the handles, but they can't all be mad out of the same tree. The only con is that it took two weeks to ship to to me in California, but the quality can't be matched at this price! This is my 7th UNITED PIECE, first off the peg holes on every wall mount that I've gotten from them has never been level. It makes the swords hang crooked. 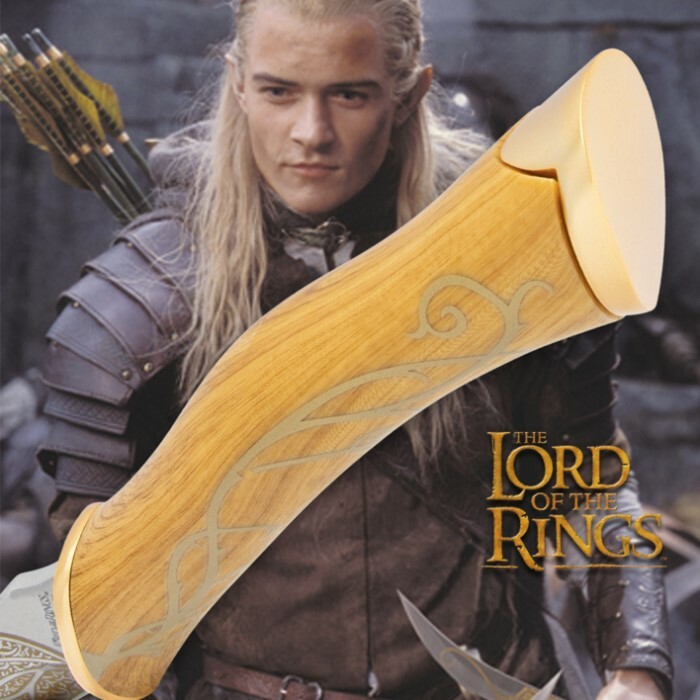 The legolas knives are really nice though,the only thing was there was little glue stains along the handles. BUDK was fast with shipping and everything went smoothly. Beautiful blades and amazing plaque. Only notable problem is that the edges were not NEARLY fully sharpened. In fact, the only way that the bade would be effective is if you fell face-first into the tip. These swords are very nice and made extremely well. The detailing is excellent. The balance and weight of these swords almost make you to try to sling them around, highly unadvisable though. THEY ARE SHARP. The only thing that would have been nice to have come with these would be the sheathe's. Even if sold separately or as an option with an addition cost. The best thing of all is that while my son and I are very close, making the decision to begin a sword collection has actually given us a whole new conversational and bonding experience. Now we are saving our pennies and deciding the next of the series we intend on adding to the wall. Keep'm coming BudK, Thanks for being here and having such cool and well made products. Love these knives! They look fantastic hanging up and they are actually very sharp. The craftmanship is great. I only have one criticism: the hilts are a yellowy-gold colour. I was pretty bummed out by this as (being a massive lotr fan) I knew they were described in the books and movies as being white-handled. Still, they're my favourite item in my collection!